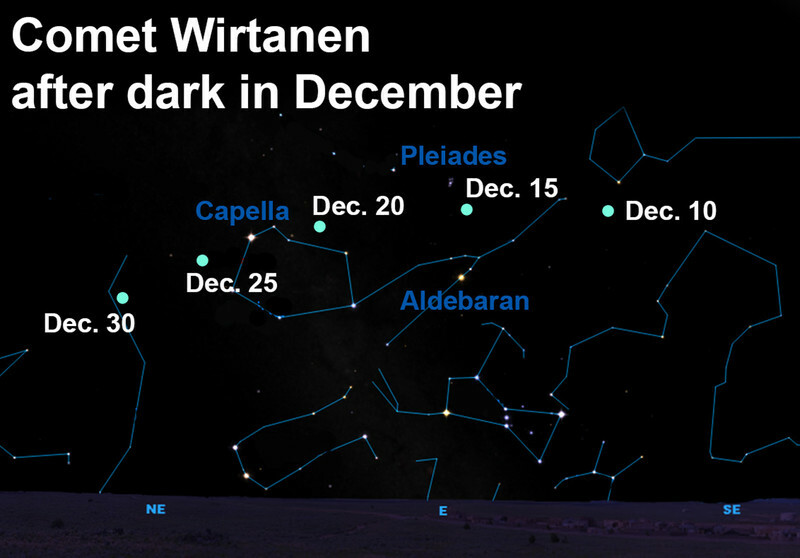 Not many know the name Carl Alvar Wirtanen, but in December many stargazers will be saying it. On Jan. 15, 1948, he discovered a faint comet that has become bright enough to see with binoculars — and maybe even bright enough to see with the unaided eye this month. Originally, astronomers calculated that Comet 46P/Wirtanen orbited the sun every 6.7 years, but this is now known to be 5.5 years. This is because the gravitational pull of our solar system's largest planets has reshaped its orbit enough to bring it some 51 million miles closer to the sun, passing only 5 million miles outside of our planet's orbit. Comet Wirtanen, like all others, is one of billions of tiny icy remnants of the primordial solar system that tumble silently through the vacuum of space. Occasionally one of these cosmic nomads drifts inward toward the sun's heat, and its ices disintegrate into a cloud of gas and dust around its nucleus (the coma). Sunlight and solar wind act as fans and blow this material outward to create one or two tails that always point away from our star. As compact as a comet's tail may appear to us from Earth, its material is actually distributed over tens of millions of miles; in fact, to achieve the density of the air we breathe, a comet's entire tail would need to be compressed to fit into the size of an average suitcase. In other words, a comet is the closest thing to nothing that's still something! Just how bright Comet Wirtanen becomes, however, is anyone's guess. Comets are notoriously fickle; they can flare up at any time, or they can fade and go totally unnoticed by the average stargazer. As noted comet hunter David Levy likes to say: "Comets are like cats; they both have tails, and they both do precisely what they want to do." Their unpredictable and ghostly nature has led people over the ages — even some today — to interpret them as cosmic harbingers of doom. Nevertheless, it should be possible to spot this interplanetary nomad in the evening skies of December if you've got a dark sky far from the lights of large cities. Simply use the sky maps in this graphic (or at skyandtelescope.com/astronomy-news/comet-46p-wirtanen-approaches-earth/) to find the stars and star patterns in the area and use binoculars to search for a small fuzzball among them. During its trek northward in our sky, watch for Comet Wirtanen to pass through the constellations Taurus, Perseus, Cepheus and Auriga. On the nights of Dec. 15 and 16, the comet will appear to pass between the bright star Aldebaran and the tiny Pleiades (Seven Sisters) star cluster; at this time, it will have reached its closest to the Earth — a mere 7 million miles — but bright moonlight might make spotting it difficult. Keep watch on it as it drifts northward against the fixed stars. By Dec. 23, look for it during early-evening hours near the bright star Capella. From then on, bright moonlight won't be a factor in early-evening viewing. Though Comet Wirtanen most certainly won't become a spectacular sight like some comets of recent history, it will definitely be worth checking out! 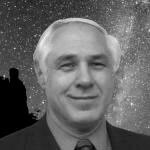 A comet cometh after dark this week. Visit Dennis Mammana at dennismammana.com. To read features by other Creators Syndicate writers and cartoonists, visit the Creators Syndicate website at www.creators.com.